Merrick Garland, President Obama’s nominee to the Supreme Court, is 63 years old. And even for such a venerable institution, one where the justices are allowed to wear robes at work, that’s pretty old. Garland is the oldest nominee since Richard Nixon tapped Lewis F. Powell Jr., in 1971. Powell was 64 when he was nominated. Were the Senate to confirm him, Garland would be tied for the sixth-oldest new Supreme Court justice. 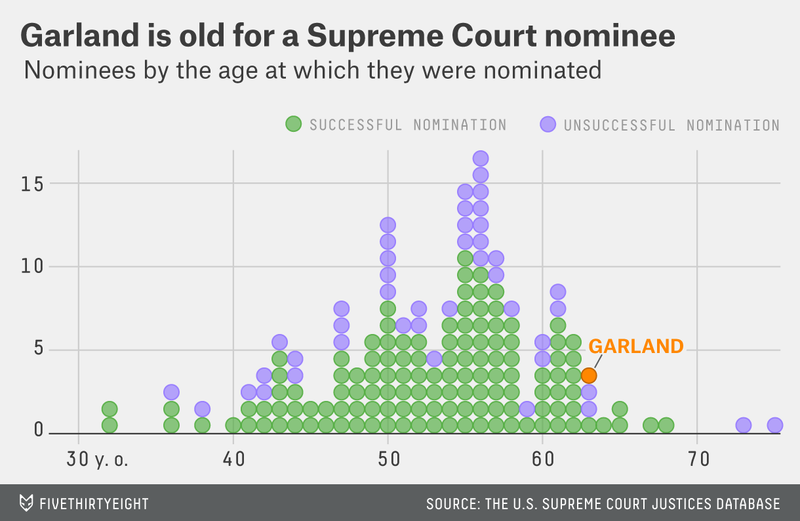 If Garland isn’t confirmed, he’ll go down as tied for the eighth-oldest nominee. Age isn’t just a piece of trivia when it comes to a potential Supreme Court justice. These are lifetime appointments and given the unstoppable drumbeat of time and the mortality of humans, the age of a nominee goes a long way in determining the future makeup of the court and how long it may be before a president’s fingerprints fade from it. Still, there have been two nominees in their 70s — the oldest being a roughly 75-year-old William Smith (his exact birth date isn’t known) — both in the 19th century. Neither was confirmed by the Senate. This chart shows the ages of all past 160 nominees, plus Garland, and whether their nomination was confirmed. The data comes from the U.S. Supreme Court Justices Database.